Traditional practices in Indonesia are very closely related to the culture of the people in the country. Every region has their own distinct traditional custom that makes them unique. Their beliefs and their way of living are usually display in the traditional practices that they carry out in the society. These 17 Traditional Practices in Indonesia will give you a picture of how Indonesians celebrate certain events. You will see that there actually a lot of values that they show through their traditions. Debus is a type of martial arts that originated from Banten, West Java. The ethnic groups in the area believe that the traditional practice is a way to show their faith in God. As long as they believe in the power of God, they will be fine. Debus is done by doing extremely dangerous things and coming out unharmed. They might slice their own skin with sharp knives, walk on shards of glass, chew those glass or penetrating needles on their bodies. This practice may scare or amaze the people who watch the performance. This traditional practice takes place in Lombok. Each year there would be a ‘war’ using food called topat. It’s a rice dumpling that is very traditional in Indonesia. People would come to the Pura Lingsar Temple to carry out the food war. They will throw the topat to each other. This practice is not meant to cause harm to people. In fact, it’s a reminder to celebrate peace in the community since it’s a fun activity. 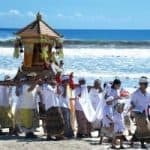 Nyepi is a traditional practice carried out by all the Hindus living in the country, especially Bali. 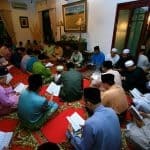 The practice itself has been listed as a national holiday in Indonesia. This practice focuses on silence. The Hindus meditate and fast during this day. They are not allowed to do their usual daily activities at all. They cannot leave their house either. The lights are turned off during day and night. Those who are not Hindu are expected to respect this tradition. They are not allowed to cause any disruption and are encouraged to stay silent in their houses as well. The Pasola is a traditional practice that comes from East Nusa Tenggara. It is the Sumba people’s way of asking God’s blessing for a successful harvest. The practice consists of men divided into 2 groups. 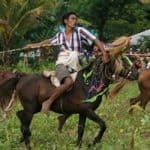 They ride their horses while wearing their traditional costumes. Each man carry a wood spear that is blunt and fight one another. Their blood is believed to make the soil more fertile. This practice takes place in February and ends in March. This is a practice that is also related to crops and harvest. Pasaji Ponan is carried out by the people in West Nusa Tenggara, specifically Sumbawa. People do Pasaji Ponan in hope that their crops will be fertile. They have a small party when it’s time to harvest the crops. It’s their way of showing gratitude to God who have made their harvest possible. The tradition will take 2 days to complete. Another traditional practice from Bali is called Ngurek. It’s actually similar to Debus. People will try to stab themselves using keris. It’s a traditional dagger with patterned blades. It is often said that the knife has supernatural power. So when people use the keris to hurt themselves, they are already possessed which make them immune to harm. 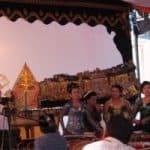 Ngurek is an act of worship to the Hindu god called ‘Sang Hyang Widi Wasa’. 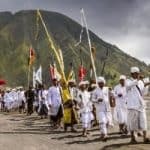 Kebo Keboan is carried out by the people in Banyuwangi. It takes place during the dry season as the practice is aimed to bring rain to the region. The rain will benefit the crops that they are going to harvest. People will make their appearance similar to buffalos. 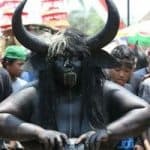 They paint their bodies in black and attach two horns on their heads. Sometimes they would smear oil all over their bodies while ploughing the streets as if they were the fields. Unlike most traditional practice that only happens once every year, Mesuryak can take place twice. It is done by the people in Tabanan, Bali. On this day, the people believe that their ancestors are coming down to Earth. They will go back to Nirvana in 10 days. 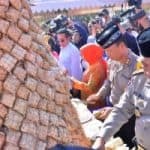 So the Balinese will throw rice and money to the sky as a celebration. Those items will accompany their ancestors on their journey. Kasada takes place in one of the most famous mountain in Indonesia, Bromo. The date of the tradition relies on the ancient Javanese Calendar. People will gather their offerings. They usually include their harvest or their poultry. The people will walk up to the peak of the mountain. There, the offerings are thrown into the crater. 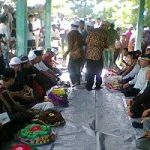 This tradition is to remember the sacrifice of Raden Kusuma, a person that is very respected by the community. This particular practice is basically a tomato war. It takes place in Bandung, West Java. The tomatoes used are the ones that appear rotten. People would throw them towards one another. The tradition symbolises the people getting rid of their bad luck and bad habits within the community. So people should try to throw the tomatoes as far as they can. At the same time, the tradition actually also celebrates the good harvest that they have received. Slametan is a popular traditional practice in Java. It is their way of celebrating a notable event such as a death or a birth. People will come to the host’s house and gather together. They would seat on the floor, surrounding a long line of food that have been served by the host. The practice includes a short speech and prayers. People will take the food home to their family and eat it together. In English, Bersih Desa can be translated as ‘cleaning the village’. 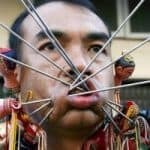 It’s a very common traditional practice that occurs all over Indonesia. In this tradition, people show their gratitude for their harvest. People would clean up their homes and the entire neighbourhoods. There will be a gathering where people share their food with each other. The peak of the tradition is the entertainment which may include a shadow puppet performance. Ikipalin: The people in Papua would cut off a finger everytime a family member has passed away. They believe that this will drive away bad luck from the death. Fahombo Batu: The young men in Nias Island jump over boulders that are as high as 2 meters while wearing traditional costume. This practice shows that they are now mature. 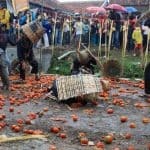 Pawai Jampana: This is a practice in Bandung that includes carrying food and harvest on a huge litter. It is paraded all over the city. People will then try to take some of the items for themselves. Peresean: This is a rattan sword fight in Lombok by the Sasak tribe. Two men fight each other but are only allowed to attack the shoulder and the back. Rambu Solo: Toraja people do this practice for the spirit of those who are no longer alive. Buffalos and pigs are slaughtered with the amount depending on social status. Most of these traditions can be seen by the public. Those who do not belong in the community are allowed to watch or participate as long as they are respectful.